Disclosure: We are a participant in the Amazon Services LLC Associates Program, and affiliate advertising program designed to provide a means for us to earn fees by linking to Amazon.com and affiliated sites. Please note that some of the links in this post are affiliate links and I will earn a commission if you purchase through those links. 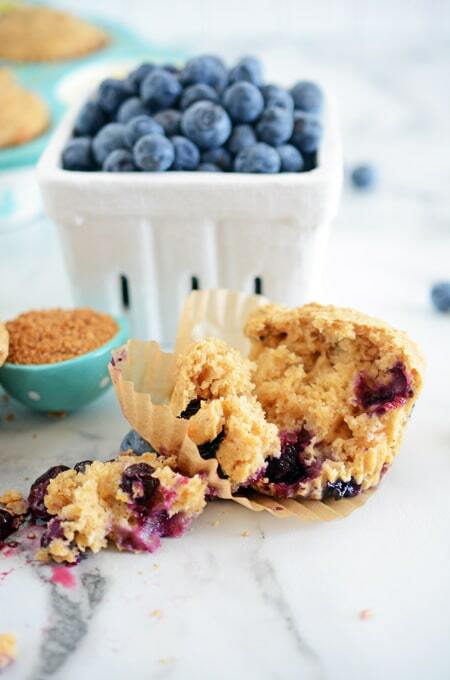 This was the Blueberry Muffins recipe I got to help test for Americas Test Kitchen’s book, “Naturally Sweet “. 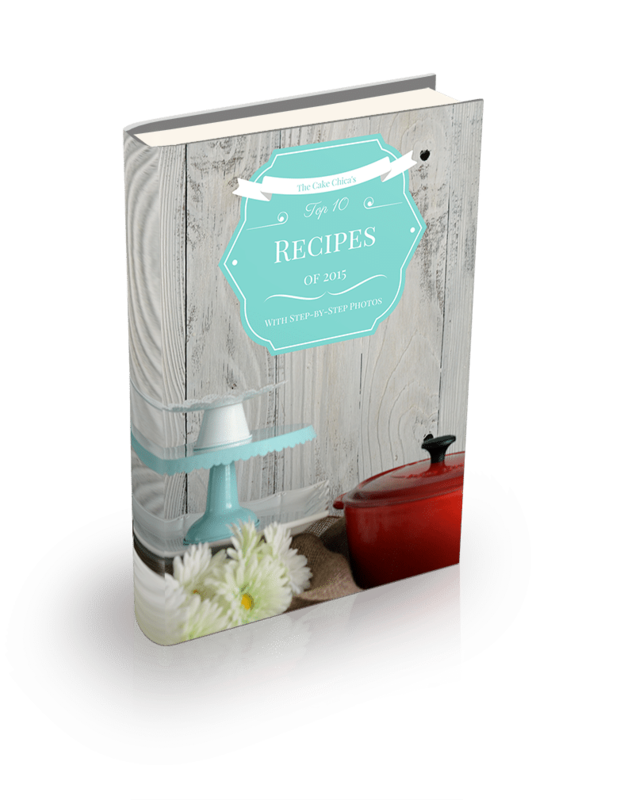 I was super excited to help test recipes for this book because the focus is not just on reducing sugar but replacing it with natural sugars like Sucanat , coconut sugar , date sugar , honey and maple syrup . No artificial sugars here! 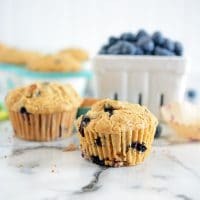 When I made the draft version of these Blueberry Muffins I didn’t think they were anything special, until I noticed my husband and I kept going back for more. I think we just weren’t used to the reduced sugar but the blueberry flavor was there and I think that’s what kept us going back for more. Finally a muffin that wasn’t overly sweet and didn’t mask the blueberry flavor. 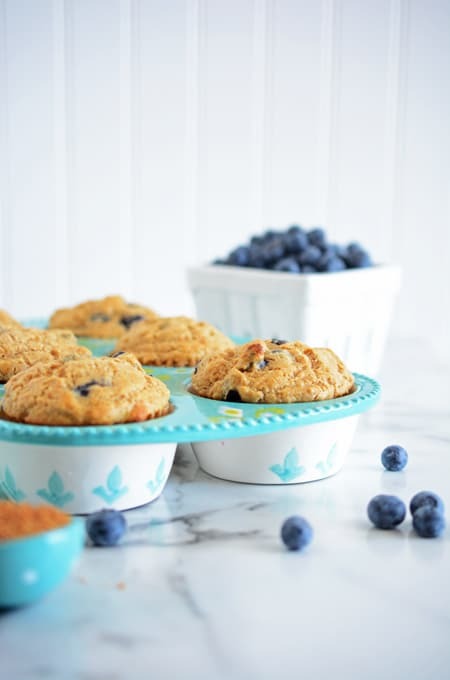 I am crazy excited to share the perfected, reduced sugar recipe with you now! 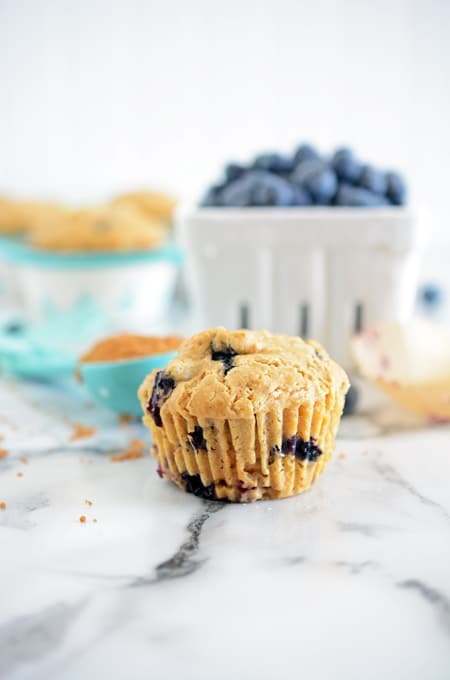 A typical blueberry muffin recipe has about 20 grams of sugar, while this version has only about 11 grams of sugar. You do not have to grind up the Sucanat, but the granules will leave marks on the top of your muffins as they melt during baking. They will taste the same, just look a little speckled. 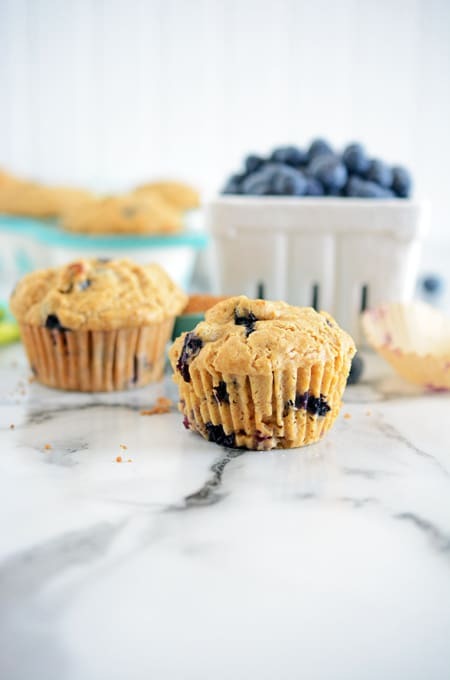 Low-fat yogurt can be substituted for the whole-milk yogurt, but the muffins will be slightly drier. 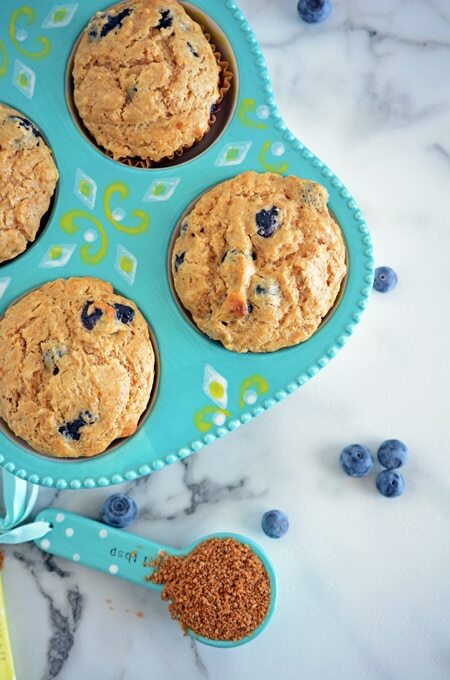 Frozen blueberries can be substituted for fresh. Coconut sugar: ½ cup plus 2 tablespoons (3 ounces) Muffins will taste slightly sweeter using this sweetener substitute. Grind sugar in step 1. Granulated sugar: 7 tablespoons (3 ounces) Muffins will be slightly less sweet and lighter in color; do not grind sugar in step 1. If you’re looking for reduced sugar recipes but want to stay away from artificial sweeteners I highly recommend America’s Test Kitchen’s “Naturally Sweet “. I personally made this recipe using Sucanat in the test batch and the final version and love it as a sweetener. Let me know how yours come out if you use the other available sweeteners. Be sure to follow me on social media: Facebook, Instagram, Pinterest, Twitter and Yummly. You can also subscribe to The Weekly Recap where I will send you 1 email per week (I don’t want to clutter your inbox) with a link to the latest recipe on The Cake Chica and information on what’s coming up in the future. Talk with you guys next week! 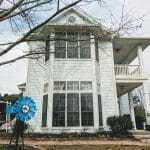 You might also be interested in Best Ever Blueberry Muffins and Blueberry Swirl Muffins. Adjust an oven rack to the center position and heat oven to 375 degrees. Line a cupcake pan with cupcake liners or grease. Working in batches, grind Sucanat in a spice grinder until fine and powdery, about 1 minute (this step is optional). Melt 6 tablespoons butter in a 10-inch skillet over medium-high heat until the butter starts to turn golden brown, about 2 minutes. Continue to cook, swirling the pan constantly until the butter turns a dark gold color and has a nutty aroma, about 1 to 3 minutes. Transfer the browned butter to a large bowl and stir in the remaining 2 tablespoons butter until melted and let cool slightly. Whisk yogurt, eggs, vanilla and orange zest into the browned butter until smooth. In a large bowl, whisk Sucanat, flour, baking powder, baking soda, cinnamon, salt and cloves together until combined. Using a rubber spatula, stir in yogurt mixture until combined. Fold in blueberries. Divide batter evenly into the prepared cupcake pan. Bake until golden brown and toothpick inserted in the center of the muffin comes out clean or with a few moist crumbs attached, about 22 to 27 minutes, rotating the pan halfway through baking. Let muffins cool in the pan for 20 minutes, then transfer to a wire rack to let cool for 10 minutes before serving.